shine brite zamorano: down with pattern. The 4th grade students and I focused on line and pattern for their first full lesson this year. 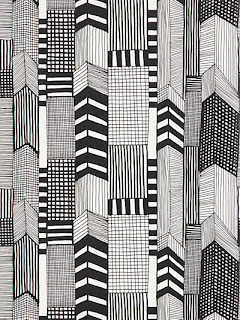 This summer I pinned a textile design by Marimekko, the super fine Finnish design company. It had an interesting play between mostly line patterns with a few 3d looking ones due to the use of diagonal lines in those particular sections. 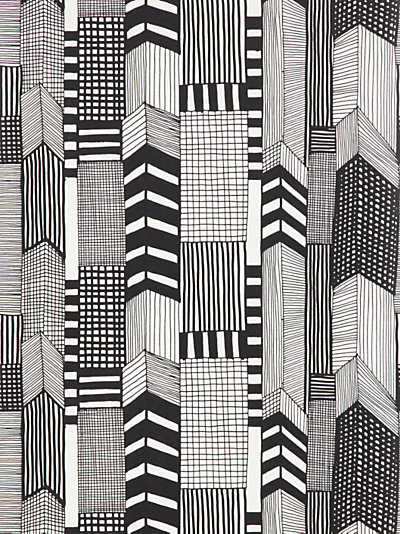 I later found out that the designer of that particular pattern was Maija Louekari. Her website provides a visual portfolio of her work. Very graphic and bold. She uses line a lot throughout her designs as well. I really appreciate the hand drawn feel of her work. The design provided an interesting investigation of pattern and contrast for my students. It also gave me an opportunity to talk about what a textile designer does for a living. They enhance our daily lives by providing us with colors, patterns, and images on things that would be pretty plain without them. Things like walls, dresses, sheets, pillows, plates, bowls, and many more are made more interesting by designers all over the world. After showing students some of Maija's other work we looked at the above images. I had students identify the different types of lines present- straight, bent, vertical, horizontal, diagonal, thick, and thin. Students quickly picked up on the rows that popped out due to the diagonals. They read these parts like corners of buildings. I asked them to squint their eyes and tell me if any of the sections stood out from the rest. The thick, bold patterns stood out to them because they contrasted against most of the other areas due to value and size. I then shared with them that the design is based on an aerial view of an urban landscape. (I found this bit of info out from john lewis, here.) I then asked what those corner patterns could be and got the roofs of homes back in return. We then identified what could be sidewalks, alleys, crosswalks, streets, and yards. This was cool because it took something that was abstract and made it more real for the students. They could relate to the design and project better. We ended up modifying our takes on Maija's design a bit. I showed the students examples I had done and asked them what was different about my versions and the originals. In a few I had selected certain rows and colored them with one or two colors. I emphasized that this made those parts stand out because they were the only parts of the design in color. In others I had broken from the using just straight lines. I included patterns based on curves, waves, and spirals, so that these patterns could imply gardens, lawns, or trees. When it got down to making our designs I demonstrated how to hold the a ruler in the middle and not at just one end or another, so the ruler was more stable. Students added anywhere between 6 to 9 vertical lines, spacing them differently so the rectangles they made could represent different parts of the urban landscape. The corners (rooftop peaks) came next. Once those were done we added different patterns using thin, regular, and wide tip sharpies. I demonstrated how they could create different value patterns by using these markers in a variety of ways. When the roofs were done, the other rectangles could be patterned. The final step was to add a maximum of 3 rows of color if they wanted to. There were a number of students who kept their designs black and white. I hope you don't mind but I've pinned your classes work on my pinterest page. I love black and white with a hint of colour, excellent. Go for it Gretchen. Feel free to check out what I've pinned too:) Just look up dmasse. I, too, am down with pattern, especially anything Marimekko. These look awesome. carol, i know you are joking about the quilt, but that would be AWESOME if you did do one inspired by a student's design:) you would seriously blow their mind! I especially appreciate your introduction activities - What a great way to explain and explore the visual impact of line! Thank you for sharing.